Adam Christopher's The Machine Awakes is a far future space opera set in the Spider War universe of Burning Dark. In the decades since the human race first made contact with the Spiders—a machine race capable of tearing planets apart—the two groups have fought over interstellar territory. But the war has not been going well for humankind, and with the failure of the Fleet Admiral's secret plan in the Shadow system, the commander is overthrown by a group of hardliners determined to get the war back on track. When the deposed Fleet Admiral is assassinated, Special Agent Von Kodiak suspects the new guard is eliminating the old. But when the Admiral's replacement is likewise murdered, all bets are off as Kodiak discovers the prime suspect is one of the Fleet's own, a psi-marine and decorated hero—a hero killed in action, months ago, at the same time his twin sister vanished from the Fleet Academy, where she was training to join her brother on the front. As Kodiak investigates, he uncovers a conspiracy that stretches from the slums of Salt City to the floating gas mines of Jupiter. There, deep in the roiling clouds of the planet, the Jovian Mining Corporation is hiding something, a secret that will tear the Fleet apart and that the Morning Star, a group of militarized pilgrims searching for their lost god, is determined to uncover. ADAM CHRISTOPHER is a novelist, comic writer, and award-winning editor. 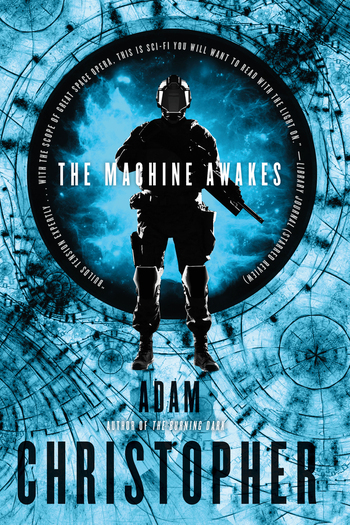 The author of Seven Wonders and Hang Wire, and a co-writer of The Shield for Dark Circle Comics, Adam has also written novels based on the CBS television show Elementary. His debut novel, Empire State, was SciFiNow's Book of the Year and a Financial Times Book of the Year for 2012. Born in New Zealand, Adam has lived in Great Britain since 2006.